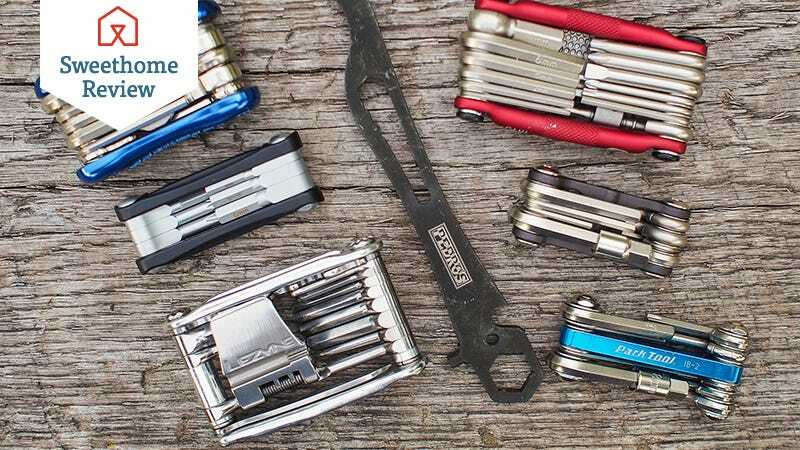 We spent two months and logged a total of 1,000 miles putting 15 bike tools through dozens of en route and at-home repairs, and found the Topeak Mini 9 to be the best multi-tool for casual cyclists. If you’re willing to pay more for a lighter tool, check out the Specialized EMT Pro Road. If you’re a mountain biker, the Crank Brothers m19 has the additional tools you need. And for you single-speed/fixed-gear folks, the Park Tool MT-30 has a wrench for removing bolted wheels. This post was done in partnership with Sweethome, a buyer’s guide to the best technology. This is a condensed version of The Best Multi-Tool for Most Cyclists; read the full review here. As the former editor-in-chief of Bicycling magazine and an avid cyclist for three decades, our reviewer Peter Flax has been fixing bikes for a long time. Along the way, he’s bought, used, and tested scores of multi-tools. In addition to Flax’s own expertise and hours of field testing, we read hundreds of Amazon reviews from regular people who have purchased and used these products out in the field, as well as scores of product reviews of every tool in this guide from cycling magazines and websites. A great bike multi-tool should be light and compact and have all the tools you need to address common issues on your bike. That means the best for you varies based on what bike you ride. But for most folks who are just biking on paved roads to and from work or for fun on weekends, the Topeak Mini 9 fits the bill. The Topeak Mini 9 is super compact, but includes nine tools (seven hex bolts, one Torx bolt, and a Phillips screwdriver), all arranged so that you can actually use them (a lot of mini-tools try to cram too much into a small space, making it difficult to actually use the tool on your bike or gain enough leverage to turn a stubborn bolt). All of the Mini 9’s tool bits are of high quality, made of hardened steel, and long enough to give you enough leverage to do common repairs. We used the Topeak Mini 9 for adjusting saddle height in the rain, replacing bolts on cleats, and loosening a tight stem. You won’t find a chain tool for taking off and installing your chain in a pinch (we have a pick that does have one below), but this shouldn’t be an issue if you stick to paved roads. For a compact tool, the Topeak’s bits are easier to access than those found on competitive products because it is a little longer. Even so, the Topeak is also super light—just 92 grams compared with the similar Park Tool IB-2, which weighs 108 grams. But it wasn’t the lightest tool we tested. The lightest tool we tested was the 65-gram Specialized EMT Pro Road, and it’s also looks the coolest. At its current price of around $30, it’s not cheap, and it lacks the 8mm and 2.5mm Allen wrenches from the Topeak. But these are less-used sizes anyway. It’s a great splurge if you already own a set of Allen wrenches at home and want something to only take on rides, but the Topeak is better for most cyclists. Though most modern bicycles have a quick-release mechanism that allows cyclists to remove wheels without any tools, some bikes’ wheels—including fixed-gear bikes, some single speeds, and Brompton folding bikes—can’t be removed without a 15mm wrench. And although there are a number of clever multi-tools or stand-alone wrenches made with the fixed-gear rider in mind, the Park Tool MT-30 is the best choice to tackle the roadside repairs a typical rider might encounter. Unlike most alternatives, the MT-30 has the right mix of hex, screwdriver, and Torx bits to handle most everything short of a broken chain. Unfortunately, the MT-30’s stubby 15mm box wrench can’t quite match the leverage of a full-size wrench, but we had no issues while testing it on four different fixed-gear bikes. These picks may have been updated. To see the current recommendations, please read Sweethome’s guide.